A spacious single room situated on the 1st floor offering a perfect getaway for the independent traveller. The en-suite has a large and powerful shower, fluffy bath sheets and luxurious toiletries. 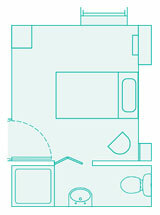 The room, including the en-suite has a floor area of 12 sq.m. Please note this room is not a sea view room.